Across the U.S. there is a tale of two types of education, with kids the same age, in the same grade attending schools that try to educate them with wildly different resources. On average, New York, Alaska, and Wyoming each spent more than $17,000 per student in 2013, while California, Oklahoma and Nevada spent roughly half that. 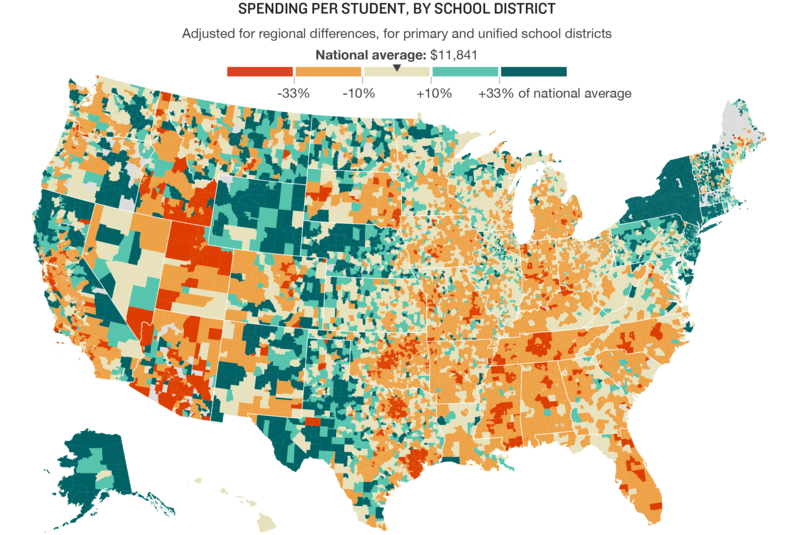 Below, you can see that remarkable variation for yourself — and find out what schools are spending where you live. A paper published in the Proceedings of the National Academy of Science examines the enormous global potential for air conditioning. As incomes rise around the world and global temperatures go up, people are buying air conditioners at alarming rates. The Brexit vote in Britain looks familiar to folks who are watching the political divide in the United States. A map of the Brexit vote in Great Britain (on whether the country should leave the European Union) shows a pattern familiar to U.S. citizens. The cities voted one way (to stay) and the countryside voted the opposite (to Brexit). Like the United States, Great Britain is a country that is divided politically — and geographically. Americans appear to be growing more skeptical of how much of a difference churches and other houses of worship make in tackling social concerns. About four-in-ten Americans (39%) now say religious institutions make little to no contribution in this area. If an additional 23 other nations follow through on their promises to join this year, countries representing about 54 percent of global emissions will have joined the Agreement, putting "entry into force" well within reach. The Montana State University Extension Community Development (CD) Update will take place Sept. 9-10 at Big Sky Resort. We will start at noon on the 9th with a lunch meeting with NACDEP and CDS Board members. Don't miss this tremendous opportunity to spend two days with some of the leading CD educators from across the US presenting on their leadership, entrepreneurship, local government and related programs. Email commdev@montana.edu for more information. The FREE MSU Extension CD Occasional Webinar Series continues on Mon. Aug. 15 at 1:30 PM (Mountain Time) featuring Ray Rasker of Headwaters Economics who will give a demonstration of two free online tools for producing socioeconomic profiles: the Economic Profile System and Populations at Risk. Join the webinar here.